* Enter upto 5 Domains. One in each line. We believe your domain is a valuable assest for your brand. we offer an unrestricted access to your domain name. We offer free privacy protection for some major TLDs. It helps to protect your information from displaying in whois. Losing your domain can create serious harm to your business and brand identity. we offer transfer and domain locks. Now, domain forwarding or redirecting is free with our DNS service. you can also change records through the panel. WHY CHOOSING THE RIGHT DOMAIN NAME IS IMPORTANT? Always register your brand as your domain name so no one else use your brand name and promote products online. It is always wise to keep domains for your valuable product lines too. Having keywords in your domain name or choosing a catchy domain is a crucial part to decide. These can be helpful in increasing your web traffic and drive more customers to your website. Seriously, What is a domain name?A domain name, is a name you want to call your website, example google.com, youtube.com. You can also choose the sufix .com, .net, .in etc. 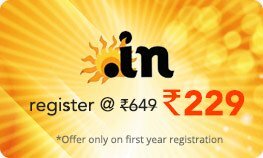 To get a domain name, you have to search to find an available name and pay an annual fee to us for the right to use that name for an year. you can also register for multiple years. 1. 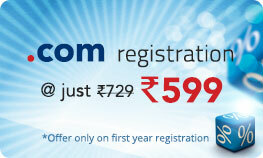 Get your Domain Name. 2. Get a Web hosting, it's just an online place to store your website and enables you to view the website at your registered domain name. 3. Design your Web Pages and get them online, there are various DIY website builder tools online where you can design and develop your own website or you can hire a web design company to do that for you. Is .com better than other extensions?Its true that .com domains are popular, but it really depends on your companies branding and customers. Many major companies have branded their domain names in .in or .net too. When you can brand and get your customers to type in the desired extension then it wont be a problem. Protect your brand onlineIf you are starting your online brand or business. It is important to make sure you register important TLD's like .com/.net and country level extensions like .in/.co.in to protect your brand. so you get full control of your domain name.